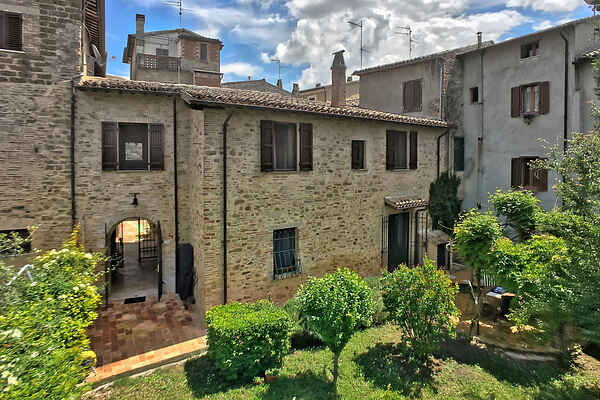 Get to know this stunning old renovated vacation home within the town walls of Bevagna. The house is extremely comfortable and attractively decorated with wood-beamed ceilings and terracotta floors. Enjoy the spacious fenced lawn. With a barbecue on the covered terrace you can host a wonderful culinary evening. You enter the house via a gate. Inside you can enjoy pure luxury, like a rain and massage shower and a covered balcony. Holiday life can be so wonderful! But do not limit yourself to 'only' this holiday home. Visit Bevagna for example! You can do your groceries on foot, eat some ice cream or have a bite to eat. Bevagna has beautiful town walls and 6 town gates. This way the town preserved a medieval atmosphere. Every year in the end of June inhabitants of Bevagna go back to this era during the festival \"Il Mercato delle Gaite\". These shows also take place in other towns around Bevagna. In Foligno (10 km), for example, \"Giostra della Quintana\" takes place during mid-June and mid-September. You surely have to visit the religious town Assisi (25 km) at least once in your life! You can admire the town, located on a hill, from far away. Parking at 200 m.
Bevagna is a perfect destination for cultural tourism, food and wine in Umbria. On the hills behind the village of Bevagna are many vineyards producing the famous red wine Sagrantino and there are producing many olive groves. www.stradevinoeolio.umbria.it/page.asp?idarticolo=94 Bevagna is home to a famous historic event that attracts tourists from around the world. Every June, the city is transformed into a medieval village. Very special! www.ilmercatodellegaite.it A 10-minute drive from Bevagna Spello is: here every year in June an important religious and cultural event. www.infioratespello.it In this area (Bevagna, Montefalco, Spello, Spoleto) are the best restaurants in Umbria. Inside the house is a book with reviews and ratings, location and price.